Salt and pepper, as desired. Beat eggs, milk, salt and pepper in microwave-safe bowl until blended. Microwave on HIGH 45 seconds: stir. Microwave until eggs are almost set, 30 to 45 seconds longer. Serve immediately. Top with a sprinkle of shredded cheese or fresh herbs. 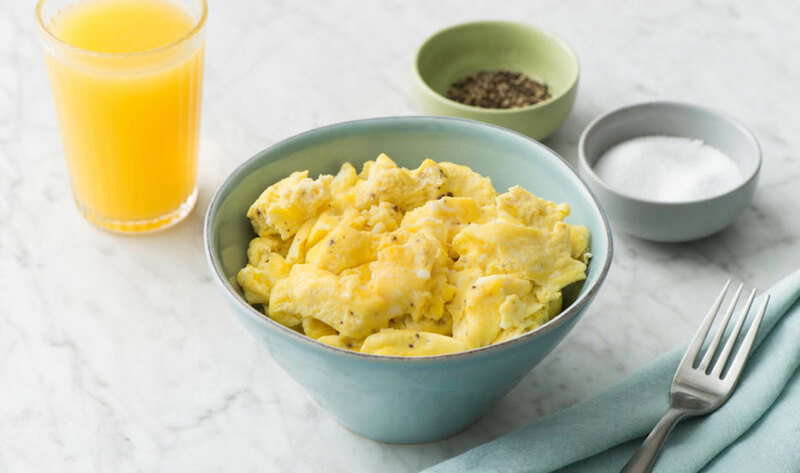 For rich creamy scrambled eggs, add small cubes of cream cheese or a dollop of cottage cheese before cooking. For added flavor, stir a bit of creamy salad dressing, pesto, salsa or your favorite herb into the egg mixture. Don’t overcook. Scrambled eggs will continue to cook and firm up after removed from microwave.